Catholic Youth Services’ Tomasz Juszczak (at the very back) with participants in the Youth Ministry Partnership Program, earlier this year. Photo: CYS. The chances of World Youth Day 2016 (WYD) having a lasting impact in Sydney have just received a major boost with 14 parishes signing up to the Youth Ministry Partnership Program offered by Catholic Youth Services (CYS). Sixteen young people will serve as youth ministry coordinators in the parishes in exchange for a financial contribution towards their WYD travel costs (two parishes have taken on two people, the others – one). 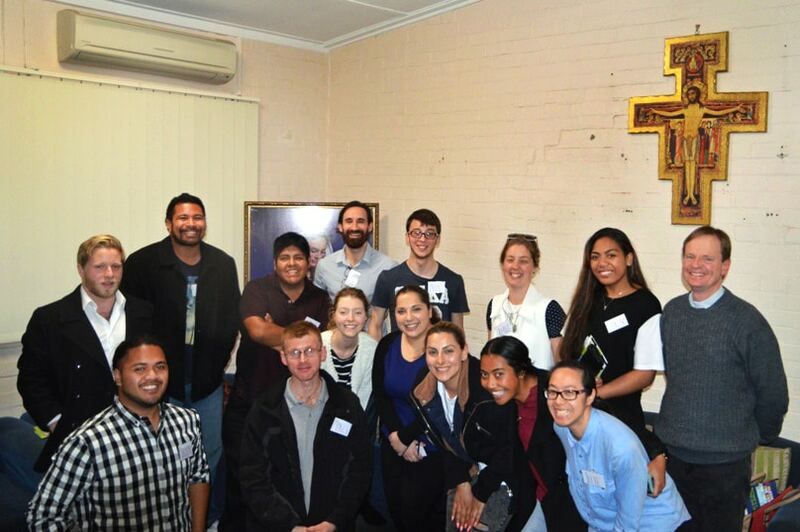 The coordinators, aged from 18 to 35, will receive ongoing training which began two months ago when CYS organised a leadership conference boasting two senior staffers from Life Teen, a well-regarded Catholic youth ministry company in the US. CYS has purchased a Life Teen subscription for each of the 14 parishes, giving their coordinators access to Life Teen’s ready-made program as well its innovative online and multimedia resources. CYS youth ministry support officer Tomasz Juszczak said they were hoping for around 10 parishes, and were delighted with the subsequent 14. “Many Catholics find it difficult to work out how they can minister effectively to young people in their parishes,” Tomasz said. “Taking someone else on who does have a better idea – who has been trained and is being supported – has proven very beneficial. The program ends a month after the youth coordinators return from WYD. “The parish can then assess whether it has been of benefit to them and are free to continue with it (having a youth ministry coordinator and/or a Life Teen subscription),” Tomasz said. Those youth coordinators who give the maximum amount of service during the program – five hours per week – will net $5,000 towards their travel costs, with a sliding scale for fewer hours. The 14 parishes who have signed up to the program are spread throughout the city, taking in Gymea, Sefton, Menai, Croydon, Rosebery, Concord, Mascot, Hoxton Park, Sydney, Blakehurst, Lakemba, Fairfield, Beverly Hills and Meadowbank.